My lunch has to get me going until 7 or 8pm. Therefore, I recently got into the habit of always having some cooked beans in the fridge. They make a perfect base for a salad. Very healthy with good proteins and low fat, easy to cook in advance and keep for a couple of days, and versatile as they can be combined with almost everything. This salad in particular I love for lunch as it is healthy but filling, as I have to run after two small children, one of them still breastfeeding. The good thing is, when time is short, that it can easily be made out of tins (tuna and beans). Just add some tomatoes, onion and green leaves. And there you go!!! Soak white beans in water for at least 4 hours. Drain and cook in water for about 30 minutes. Let cool. Steam the bok choy for about 2 minutes or until wilted. 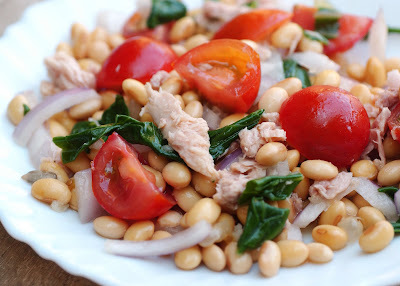 Combine beans with tomatoes, onion, bok choy and half the tuna. Combine all dressing ingredients in a separate bowl. Pour over the vegetables tuna salad and stir. Sprinkle remaining tuna on top. Ready to serve.